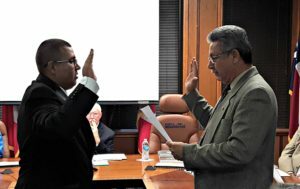 The Port of Brownsville added two new officers to its police force during the Brownsville Navigation District Commissioners regular board meeting held January 18, 2017. Port of Brownsville Police Chief Carlos Garcia administered the oath of office to officers Alejandro Saucedo and Jorge Moreno. Saucedo, 23, from Brownsville, received his peace officer certification after graduating from the Texas Southmost College Justice Institute in 2015. He previously worked as jailer with Cameron County. Moreno, 27, also from Brownsville, served in the U.S. Army Reserves, having received an Army Commendation Medal and a National Defense Service Medal. Moreno worked as a dispatcher for the Harbor Master Office and resigned in 2016 from his position to join the police academy. He received his peace officer certification after graduating from the Texas Southmost College Justice Institute in January 2017. 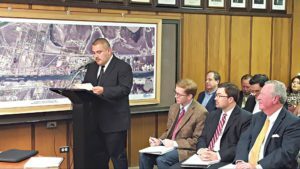 Officer Alejandro Saucedo addresses the BND Board of Commissioners January 18, 2017, after being sworn in as port police officer. Officer Jorge Moreno is sworn in by Port Police Chief Carlos Garcia during the BND Commissioners regular board meeting January 18, 2017.